It is one of those nights where I feel defeated. The words "inadequate" and "inexperienced" and "immature" and "incapable" flash in neon before my tearful eyes and hurting heart. It is one of those nights I question why I do what I do, why I dream what I dream, and why I hope in a hopeless moment. I have big dreams. I have big desires. I have a big God, and with Him should come big faith, right? Honestly, in this moment the only thing that feels big are my fears. Grad school looms in the future. Maybe. These applications and essays and phone calls and weekends traveling. I'm dizzy just writing it out. I worry. I wonder. I wait. What if my professors think I'm ridiculous for applying here? What if these schools laugh at my youth and inexperience? What if I become tongue-tied and timid? What if it is a giant waste of money? What if I don't get in? What if I do get in? What if grad school isn't God's plan for me? What if... what if... what if.... I could spend all night in this camp and not get a wink of sleep. I am convinced so deep within my soul that my passion for theatre is from the Lord. At times it doesn't make sense. At times I feel very alone. At times I think that no one else understands. More times than not it seems as though I'm standing in cement, unable to move. The lies tell me that I should have this figured out by now. That I should have conquered my fear of rejection and fear of failure by this point in my walk with Christ. That because I still struggle, my significance is minimal as is my influence. I want to know what's next. I want to decide what's next. I want a color-coded calendar of my next five years. I want to be settled and secure and someone's only one. I want to be successful in the eyes of friends and family. I want to be looked up to and respected and held of high importance in my field. I have never felt more out of control in my life. Seven months ago I flew 2,000 miles from home and moved to the PNW. I said "yes" to Jesus and the bright lights pointing to this city and this job. Even today I'm 100% positive that this is where I am supposed to be. But in the middle of my season of confusion and surrender (we'll get to that tricky word later) I'm looking back at my answer and cringing. It seems I said "Yes, I will go, and I'll stay until I decide what's next." That is not the same as "Yes, Lord, I will go where you say!" I'm not sure why I am so eager to high-tail it out of here. Maybe it's a knee jerk reaction to facing difficulty. 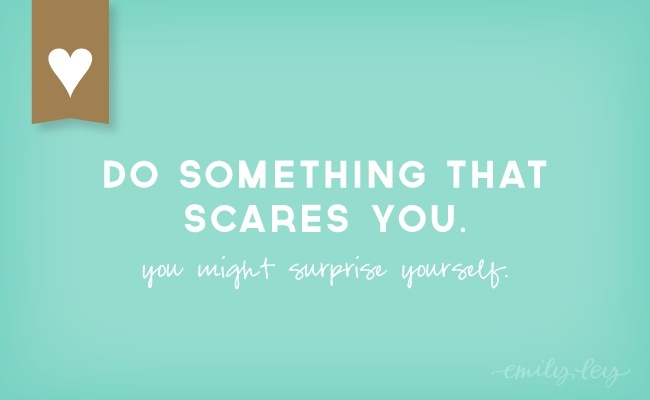 Maybe it's my spirit aching for my comfort zone. Maybe it's the roots I'm desperate to dig deep shrinking for fear of being ripped from the soil. Maybe --and most likely-- I sense something big up ahead, a big risk, and fear has sent me packing my bags. Don't even mention being single in the midst of all of this. Honestly I've been in a season where the thought or worry doesn't cross my mind. But in the moment it's tough. Daily social media reminds me that engagement, marriage, and homemaking is happening amongst my peers. My favorite bloggers are snapping Instagrams of their neat newlywed homes and bonding over baby fever. Then I'm over here zipping from one part time job to the next, ready but so far from ready to be financially independent, unable to remember to make my bed let alone make a meal when I finally cross the threshold of my house that doesn't feel like my home. I'm tired of feeling less than. I'm tired of being frustrated with myself for a messy feed on this social network or the other. I'm tired of over-sleeping and over-eating and over-spending and over-analyzing every aspect of my life. I'm tired of wishing for change and sitting on my rump without doing anything about it. And man, is gratitude powerful! I'm thankful for a community of friends --a community that spreads across this great nation-- that loves me and hugs me and prays for me daily. I'm thankful for parents willing to trust me and support me, to send me across the country to interview and investigate a prompting the Lord put on my heart. Parents who encourage me and want what's best for me. Parents who brought me up to believe that God's plans and timing are perfect, and often quite different than ours. I'm thankful for my hobbit hole of a room, filled with colorful clothes, inspiring quotes, and twinkling lights that remind me I have been abundantly provided for and blessed. I'm thankful for a place to retreat, to read, to write, to rest, to ramble, and to revel in the goodness of God. I'm thankful for a job. I'm thankful for TWO jobs. I'm thankful for the ability to work in my field, to journey to an inspiring place each morning, and for the opportunity to make a positive impact on the lives of 46 children four days out of the week. I'm thankful for the patience of my mentors, the graciousness of my co-workers, and the lessons learned in every moment, minute, and mistake. I'm thankful for the little things. 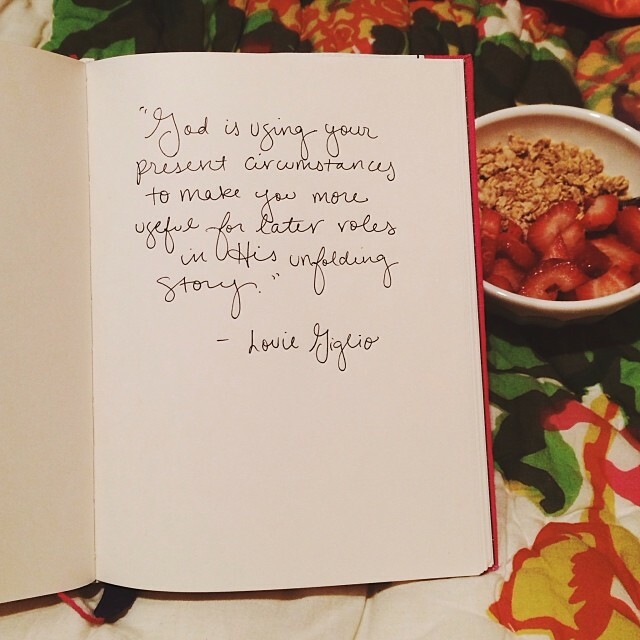 I'm thankful for an empty journal, a well-worn Bible, a favorite book. A ink-stained calendar, a well-sharpened pencil, and a gold-foiled quote upon my wall. I'm thankful for my electric blanket, the gift of a bed, and a taste of home. I'm thankful for the mile walk to the lake and the people to watch as I jog. I'm thankful for coffee dates where no work is accomplished but hearts are warmed and delights are shared. I'm thankful for a car that runs, an internet that connects, and a camera that captures the simple moments. I'm thankful for the freedom to pick up and move across the country. I'm thankful for the security that I am desired by the Almighty One and cared for as His bride. I'm thankful for the hope of what's ahead but the peace He promises for today. I'm thankful for each and every breath that I'm not promised, and the adventure that's up ahead. My heart tightened and breath halted at that word: ADVENTURE. 2013 was the year of adventure and hope, and boy was it good. 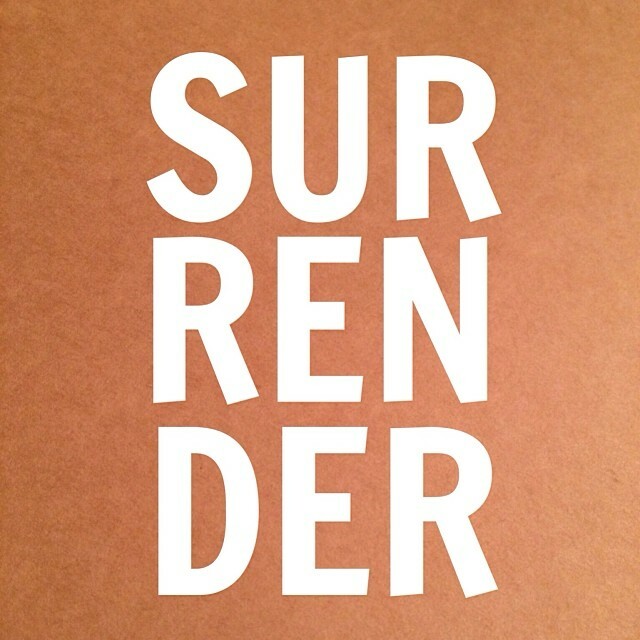 2014 is the year of surrender. And this is what it boils down to today. It's time to surrender control. For real this time. It's time to surrender my dreams. To release my white-knuckled grip. It's time to surrender my comfort zone. And here come the tears. It's time to surrender the desire for companionship. My God is enough. It's time to surrender the need to know. "The secret things belong to the Lord..."
This has been a long time coming, and it's time to stop running. I don't think you understand the way my heart is quaking right now. My fingers are tingling and struggling to string together these words. I just want to know! There is no "just" in that, really. I want to know. I want to do. I want to be. It is a desire that is holding me captive. It's time to activate the faith that I am called to. I need Jesus more now than ever. There hasn't been a personal tragedy or some great catastrophe. My heart can simply take no more. I don't need to know. I don't need to have it figured out. I don't need to please anyone. I don't need to do A, B, or C.
I am a dreamer. I always have been and always hope to be. When I say "dreamer" so many images and ideas come to mind. I used to think of dreamers as people with unrealistic expectations and a light grasp on reality. Dreamers expected the impossible and missed out on what was right in front of them. I didn't want to be one of those people. I didn't want to own that title. And for a long time, I dreamed small. Being a planner and a dreamer didn't make sense to me. I wanted to dream big but I wanted a five point plan to make it happen. I've learned that's not how it works. For a long time, my definition of dreaming with Jesus meant telling him the things on my "checklist for a successful life" and crossing my fingers that they'd happen on my timeline. Let's just say, that didn't get me too far. These days, I tend to dream in six different directions. And some of these are BIG dreams. Bigger dreams than my typical, type-A self can rationalize. 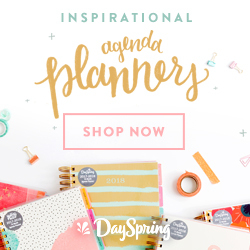 Oh, I'm still a planner and often the lack of a plan drives me to inaction, but being a dreamer in these past few seasons has taught me so much. Being a dreamer of BIG dreams calls for faith. BIG faith. INCREASING faith. And that hasn't been my forte. Thankfully there is grace. And time. And a patient God who cares about my dreams. This year He has truly taken me on a journey of refining and defining the biggest dream of all. It no long fits into my box. Which is terrifying. And exciting. I had a picture in my head of what I wanted my future to look like, but He is teaching me that I want what He has planned even more than that. And as gracious as He is, He gave me something of a mission statement to hold onto. This dream is not attached to a place. It is not attached to a particular person. It is not attached to a calendar. Theatre isn't even specifically listed in there (believe me, I tried to sneak it in but He worked it back out...). But those three things are each part of the purpose I know He has for me. They can happen anywhere, with anyone, at any time. So while I may not know all the smaller details I'd like to, I know the One who is faithful, giving, and trustworthy. I'll end the way I began, by quoting one of my favorite movies: "Go on. Live your dream." Let Him shape it as you go. 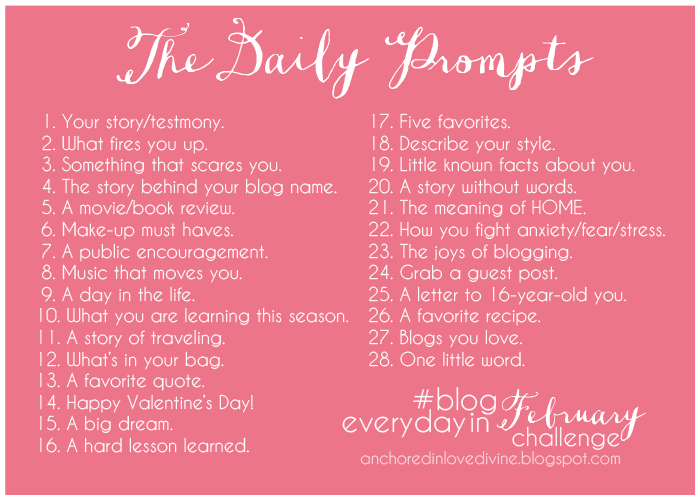 So here is my INVITATION to YOU to join me in the #blogeverydayFEB challenge. Below I have provided a list of prompts for each day to get you started. The idea of posting every day may seem daunting at first, but with a little prep it will be totally manageable! Feel free to follow one of the prompts, all of the prompts, or none of them. The main goal is to get us all writing together, and we may as well learn more about our favorite bloggers and get to know new ones while we do it! There really are no rules to this. I have provided a button that links back to the prompt page for ease of access, and I will offer a link-up at the end of each of my posts if anyone wants to join in that way. I semi-followed a similar blog challenge last May and really loved it! If you share your posts on Twitter or Instagram, be sure to hashtag #blogeverydayinFEB so we can all follow along! If you're in, let your readers know what's coming up and give them the opportunity to join in as well. The challenge starts this Saturday, February 1st! Working through Lara Casey's Power Sheets was a much needed break from the rush and restlessness that a week of e-mails and paperwork spun me into. It is easy to lose perspective on what matters and what makes it all worthwhile, and a lunch date by myself at Panera was just the trick. When the laundry piles up or the to-do list is three pages long, a deep breath and a moment to refocus can make all the difference. Below is the collage I made for my 2014 visual to capture my goals and what fires me up. 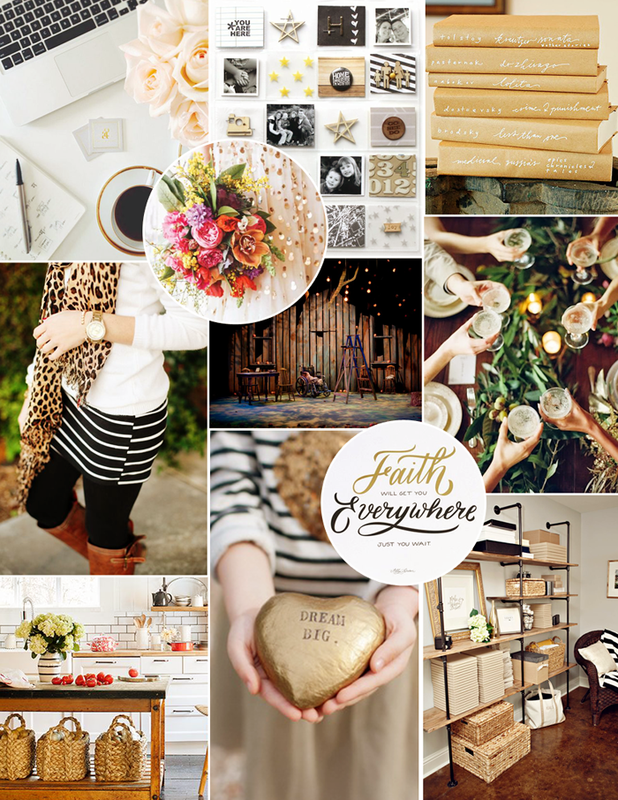 I'm dreaming of plenty of white and warmth, lots of glitter, bright flowers, and inspiring work spaces to name a few. I get excited and feel more productive just looking at this lot. More of what fires me up: Dressing up for work. Dinner at Mel's. A new journal. A good pen. Art museums. Reading inspiring blogs. Going to the theatre. Bright sunflowers. Adoption stories. The Message Bible. Christmas music. Rifle Paper Co. Thrift store shopping. Lifegroup. New worship music. Being out in the rain. Frank Sinatra. Movie scores. Meeting blogging friends. Re-reading old diaries. Time with my family. Words from the Lord. The Amplified version. Shakespeare. Phone dates with Mom. Gold foil. Making dessert for Lifegroup. Country music. Cobalt blue. Red lipstick.Wandering the market. Traveling alone. And much more! This has been a long time coming. Some of my favorite bloggers shared their 101 in 1001 last year and I wanted to jump on the band wagon right away. However, it took me MONTHS to come up with my list. It was hard! I had grand plans of sharing it January 1st since it was my starting date, but the last 5 items evaded me until last night. I'm still using the start of 2014 as my beginning date though ;) One way I plan to activate this is in part of my Powersheets. I'll choose specific goals to work on each month and make time/practical steps to accomplish them. Let's see how this goes! So without further ado, here is my list of 101 Goals in 1001 days. To be completed by September 27, 2016. 3. Build a relationship with my sponsor child. 8. Re-read my college journals. 9. Become a member of a church. 13. Get into grad school. 22. Go to Baylor Homecoming. 26. Meet an author I love! 29. Go to a country concert. 33. Blog series every day for 1 month. 35. Go to an Instagram meet up. 37. Help someone pull off a surprise. 39. Do ballet barre for one month. 43. Host a Christmas swap. 45. Learn how to better use my Canon Rebel t3i. 46. Work with a blog friend on a project I believe in. 48. Create an Etsy shop. 49. Activate artists in my church. 57. Write for another blog/magazine/website. 58. Do the Color Run. 59. Take a Zumba class. 64. Go to the tulip festival. 66. Do a wine tasting. 73. Invest in Anthro dishes. 75. Sell/donate excess in storage. 77. Try a new cut/do/style. 79. One Little Word 2014. 82. Be IN a show. 84. Rock the top knot/messy bun. 88. Take a spontaneous road trip. 89. Attend Making Things Happen. 90. Go to a professional sporting event. 91. Attend a blogger meet up/conference. 94. Fully run Green Lake. 95. 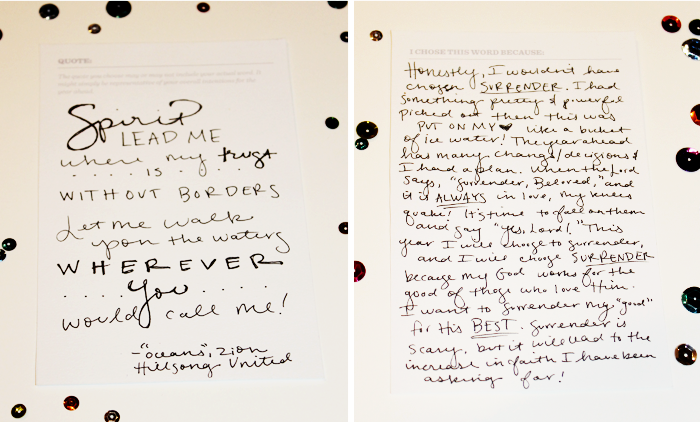 Own a Lindsay Letters canvas. 96. Master the art of Nanny's spaghetti. 97. Subscribe to an inspiring magazine. Y'all, the Lord has been reading my mail! Actually, He's been sending some of the sweetest love letters and most difficult packages to my doorstep daily. Want to know how I know? Because last night I was wrecked in the best way possible during my dance class. Yes, while dancing. Since November, Monday nights mean an hour of West Coast Swing. I spent six weeks in the basics, had the most ...unique... date of my life out on the town to practice, attended a convention of epic competition and workshops, and the start of a new year brought an invitation into the advanced class. I was excited. I was pumped. I was ready. Until I got there. The class is much smaller this go around (which is hard to do after 10 people), and I am one of 4 students. I came in a little flustered after a registration snafu and felt as though I was immediately tossed into the deep end when I had been promised a wading pool. No floaties, no nothing. In the Olympics on day one. At least that's what it felt like. We began learning new moves, and I simply wasn't connecting the dots. That is a rare occurrence and I do not like it. I became frustrated, irritated, and started searching for the exit. But that's when a neon sign began to flash in my mind. It became ever so clear. I am a perfectionist. But on top of that, if something isn't immediately perfect, I run. I run for my life. Perfectionism is something I recognized had a hold on my life in college. It's why I was president of everything in high school. It's why I don't sing in front of others. It's why it takes me 3 tries to tweet a simple sentence. I want everything to be perfect. And I want to be instantly good at whatever I put my hand to. This is neither healthy nor godly. My striving for perfection reveals my determination to be in control. My need to be in control reveals a lack of a need for a Savior. A lack of understanding that I need a Savior above ALL. I have been very blessed in life to be pointed in the direction of my talents and passions and face very little resistance. I think that goes two ways though. I'm also certain that I have faced little rejection and never had to learn discipline because I stay as far away as possible from what I deem out of my limits and beyond my capabilities. You want proof? It's the unfinished grad applications on my computer. More proof? It's the unwritten book in my journal. Even more? It's the gospel hanging on the tip of my tongue but held captive behind gritted teeth. 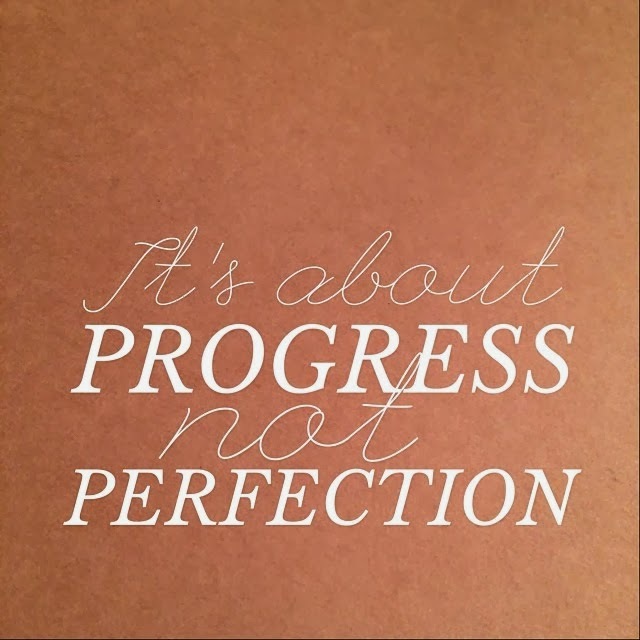 I read recently that perfectionists are often procrastinators; they sometimes think that they don't currently have the skills to do something perfectly, and therefore they don't do it all. I did a double take because this has been so apparent in many places of my life. I either have too much pride and believe that my last-minute, rush job will far surpass the average Joe's week's worth of work, or I become easily intimidated and decide that something is not part of my calling or creativity or course in life and let it alone. In my swing class, stumbling around talented dancers, I wanted to hang up my ballroom shoes and bolt out the door. Any suggestions the instructors gave, I took it as a personal critique. Any time toes were tangled when trying a new move, I wanted to toss in the towel. Any special attention given by a kind partner I received as pity and proof of my pathetic abilities. Talk about getting yourself down. At the end of class, I groaned and laughed off my inability, hoping to jet swiftly out the door. One of the gentlemen I danced with remained engaged in conversation and took the time to encourage me. He complimented my dancing, admitted his own fears and struggle, and went on to ask what I was passionate about. Instantly my moment was flipped upside down. I found the words, "I'm a perfectionist" coming out of my mouth, and he immediately applauded that awareness. He took the time to listen which allowed me to fully form my thoughts instead of ignoring the emotions that were bubbling inside of me. The tears threatening to fall minutes before were banished. Well, for the moment. My desire for perfection and my need to perform, I now see, is closely related to if not the product of my fear of man. I want to be accepted. I want to be looked up to. I want to be deemed worthy, valuable, and something special. And I have been seeking these affirmations from people, not from the Lord. How long have I let this fear keep me from stepping into the fullness of God's will for my life? I believe the answer is far too long. The Lord whispered to me while dancing, and He followed me to the car where the tears finally fell. I saw with fresh eyes how paralyzed I was. How I had been living completely captive by fear, perfectionism, and performance. Y'ALL. It is NOT worth it! It is not worth clinging to the safety net on your own. He is worth so much more! If He says step out onto the water, I want to go with no hesitation! If he says "Come away with Me, Beloved," I want to say "Yes!" not "Where?" As soon as I got home, more mail appeared before me. This time in the form of tweets from two of my favorites. Again, a neon sign stood before me. "It is okay to be imperfect." Perfection is unattainable. There was One Man to walk the earth that was perfect. But we are perfected in obedience. We are perfected in faith. We are perfected in trust. The Bible says that perfect love casts out fear. I am loved by the Perfect One, so fear begone! The places where I feel imperfect are reveal the most vulnerable places of my heart. Recently I've seen that these places have not been surrendered fully to the Lord. Ah. There it is. My old friend. My word of the year. Instead of surrendering, waving the white flag and throwing in the towel, I'm praying for greater faith and reckless abandon. Abandon of self, worry, stress, and perfectionism. I want to dance like nobody's watching even if EVERYBODY is watching. I want to sing my heart out and not care two cents if the girl beside me may as well be Taylor Swift. I want to chase the dreams God has put on my heart and not be consumed by what I perceive others will think or say. I want to cultivate greater patience, trust, and faith. Patience for the Lord to use difficult times and discipline to teach me His character, reveal His plans, and refine me into a more secure woman of God. I want to trust Him to go before me, walk beside me, and come up behind me. I want to step out in faith, listen eagerly for His whisper, and believe that He has goodness for me. 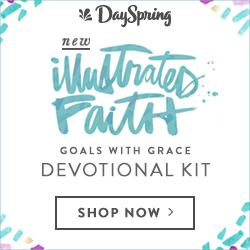 "By entering through faith into what God has always wanted to do for us --set us right with him, make us fit for him-- we have it all together with God because of our Master Jesus. And that's not all: We throw open our doors to God and discover at the same moment that he has already thrown open his door to us. We find ourselves standing where we always hoped we might stand --out int he wide open spaces of God's grace and glory, standing tall and shouting praise. There's more to come... He doesn't wait for us to get ready..."
He doesn't call me to be perfect. He calls me to be obedient. He calls me to listen. He calls me to dance with him in the midst of trouble and triumph. Even if the battle takes place on a dance floor. 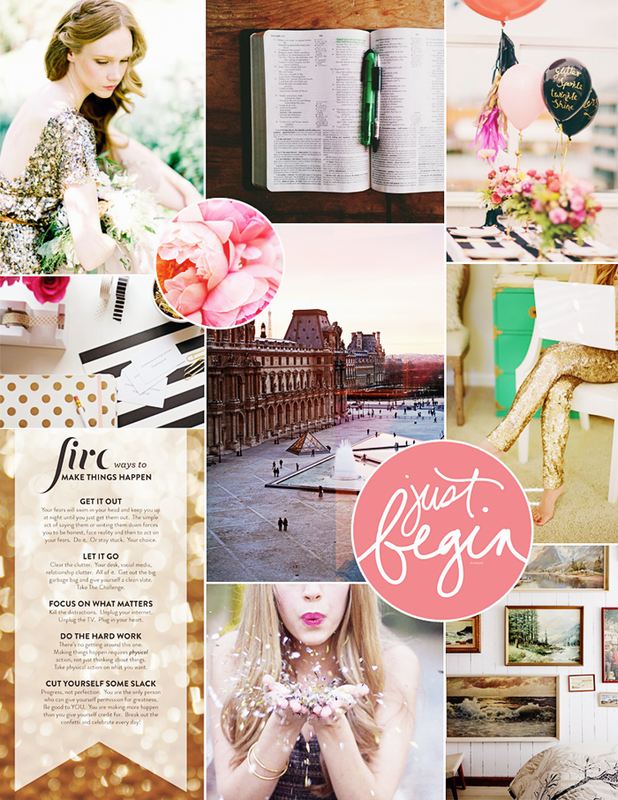 There is something about Pinterest and perusing pretty pictures that delights me and motivates me. But it also has the power to be a deadly distraction and cause of comparison. With a week full of deadlines and directing prep, I need the motivation but not the distraction. I want to make what matters happen and find a refreshing way to do that, so I put together a little inspiration board that will help me get the job done! 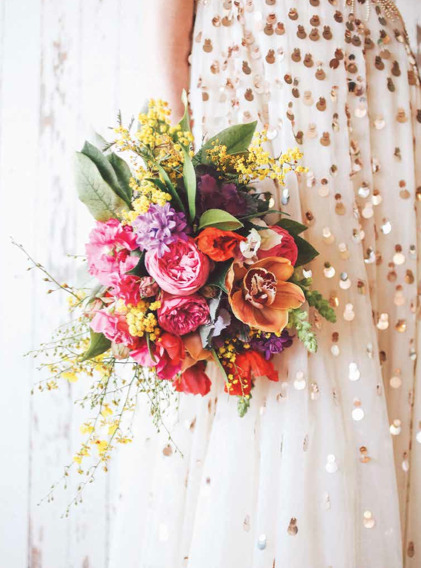 I am so fired up by sequins, stripes, sunny peonies, and spending time in scripture. I hope to find more of these in my life in 2014 than 2013, and here's to starting today! and my mouth shall praise you with joyful lips." six. seven. eight. nine. ten. eleven. but of power and love and of a sound mind." *A little encouragement from my dear friend Katie. Girl, this has been spot on and so great! For you regular followers of Anchored in Love Divine, let me tell you a little about this project! One Little Word is a workshop by Ali Edwards that spans the course of a year. Participants choose one word to explore in their life and through their album. According to Ali, "You live with it. You invite it into your life. You let it speak to you. You might even follow where it leads. There are so many possibilities." Each month we are given a prompt and pages to put together in our album, displaying and discovering new aspects of our word. It's been ages since I have scrapbooked, but I've been wanting to jump back into it. Last year was my first time to have a "word of the year" and it is one of the most memorable parts of 2013! I am eager to see how this workshop impacts my year and what I discover along the way. For my new friends and visitors, let me introduce myself. 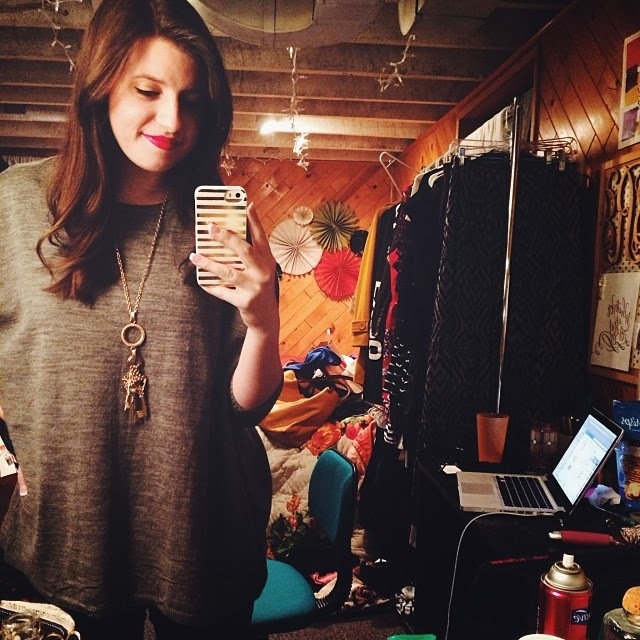 My name is Bailey Jean and Anchored in Love Divine is my little corner of the internet. I am passionate about Jesus, creating meaningful theatre, finding inspiration in the day to day, sharing pieces of my heart on Instagram, and each and every Anthropologie candle ;) I am a graduate of Baylor University (sic 'em bears! ), a Texas girl through and through, and a recent Seattle transplant. I enjoy long walks around the lake, sweet tea any day of the year, and bright yellow sunflowers. I firmly believe that everything happens for a reason, and my word for the year is absolutely included in that. Last year I asked the Lord for a word to hold onto, pray through, and trust Him with for the year. He said "hope" and "adventure". This year I had my word figured out, something pretty and powerful, then it got turned upside down. He said "SURRENDER" with the utmost clarity, and I began to quake. I thought "Surrender isn't uplifting! I feel like I'm being torn down... Not exactly a great start to the year." But I'm swiftly learning that surrender can be sweet. It's a release, a giving up of claim and control and that is EXACTLY what I've been asking for. It's going to be messy but it's going to be meaningful. I can trust Him to walk me through this season. All those things I'm afraid to surrender? That's even further proof that i need to let go. 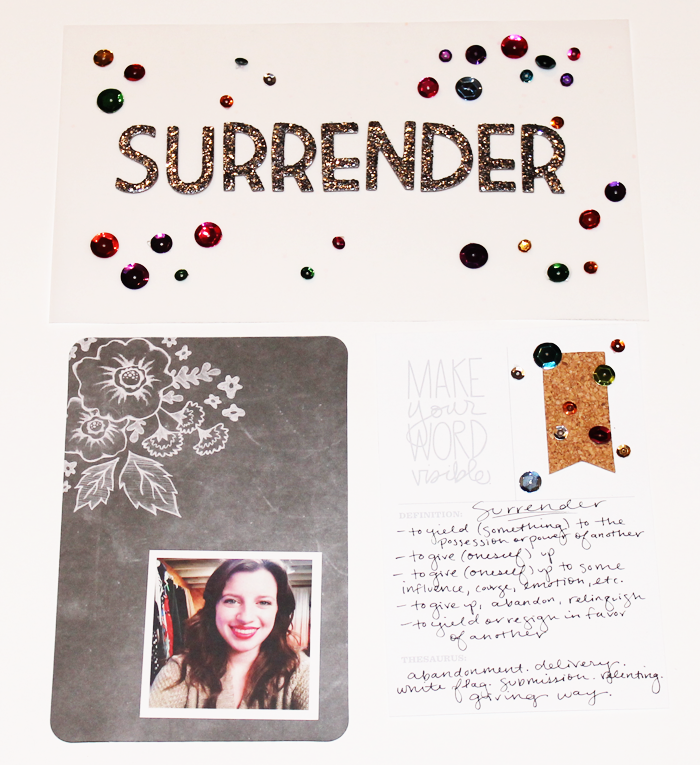 To me, surrender evokes the image of waving a white flag or throwing my hands up in the air. The latter image points straight to the act of worship, another release. Sometimes I physically have to release my hold on parts of my life and lift bare hands to the sky. I am not in control, and I can trust the One who is. Surrender isn't easy for me. I'm a girl with a plan, a color-coded calendar, and a vision. When the spyglass sees only fog, I cling to the wheel of my ship and look for the clearest path, even if it veers off course. That should be a red flag right there. 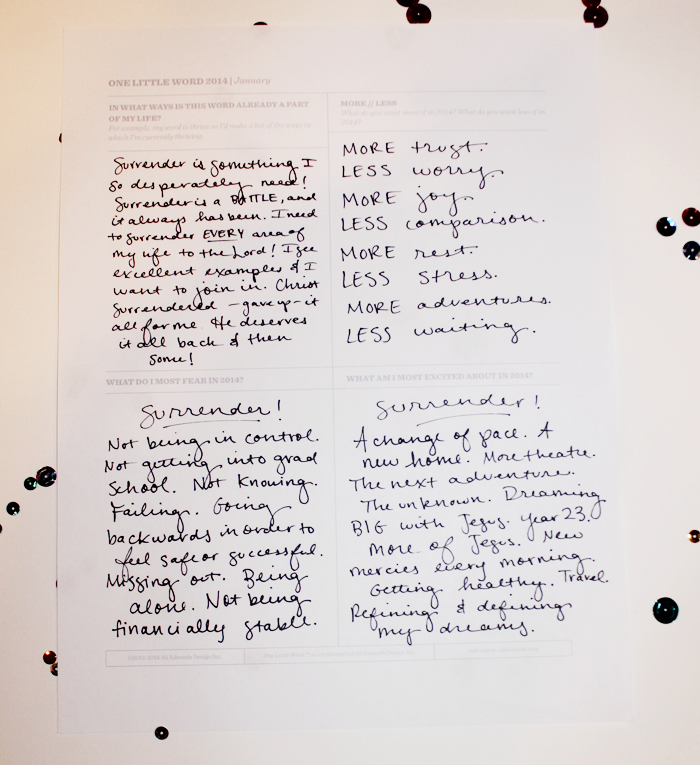 Surrender is going to and needs to happen in several areas in many different ways. Be it surrendering my comfort zone, surrendering my comfort foods, or surrendering my "need" for comfort at all costs. Yikes, I get nervous just saying that. But God is good and He's pointing me in the right direction. Romans 1:16 in the amplified version says "For I am not ashamed of the Gospel (good news) of Christ, for it is God's power working unto salvation [for deliverance from eternal death] to everyone who believes with a personal trust and a CONFIDENT SURRENDER and firm reliance..." The good news, the Word of God, is worth surrendering to this year. It's worth it every year. 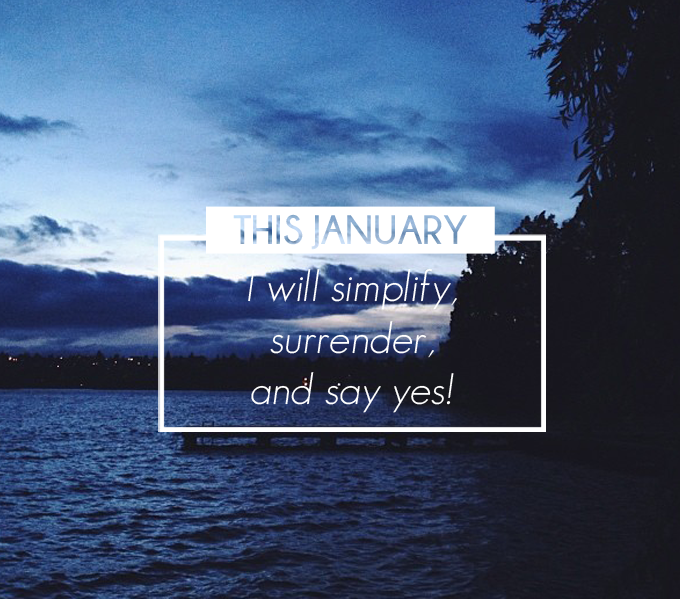 Hopefully that's where I'm headed, confident in my surrender, in my choice to say "Yes" to His plans. Surrender is going to be a challenge, but it is also thrilling to know that this year isn't up to me. I'm already seeing evidence of a change and hope to pursue it further. So that is how I chose SURRENDER. 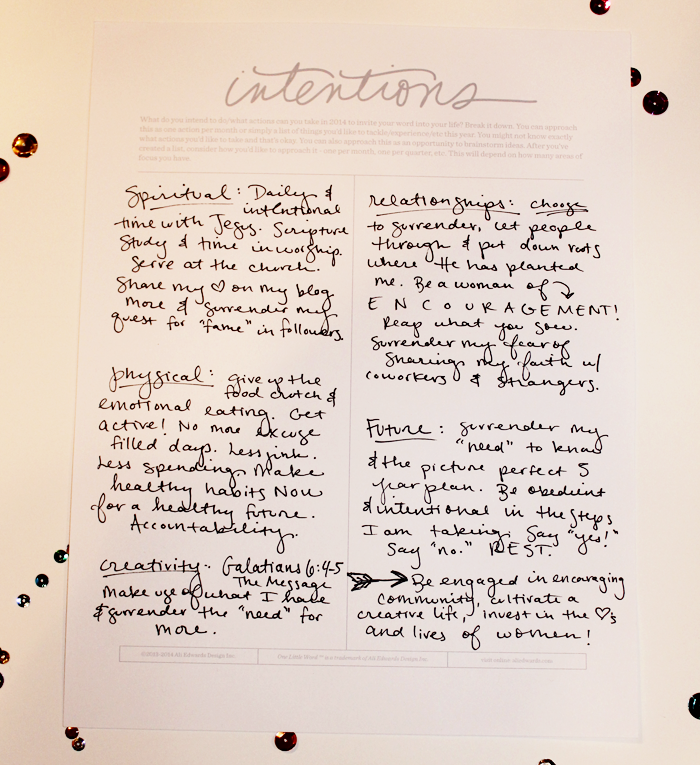 I want to make my word visible, tangible, and meaningful this year. Plus I am so excited to read about each of you and to learn why you chose your word! The link up tool and instructions are below. I've even included a button you can snag and put on your sidebar/ at the bottom of your blog post that will link back to this page. Have a happy Monday, dears! Hip, hip, hooray! It's 2014! I hope you had the happiest of New Year's Eves and celebrated the night away with friends and family. My Tuesday night included a free performance of The Compleat Wrks of Wllm Shkspr(Abriged) --and yes that's how the title is spelled!-- followed by dancing, Taboo, and sparklers with friends from church. We welcome the New Year in style and then it was off to bed. Actually, I had good intentions of going straight to bed but I spent several hours an hour in Photoshop and on Blogger giving this site a revamp. What do ya think?! 2. SPEND TIME IN THE WORD DAILY. 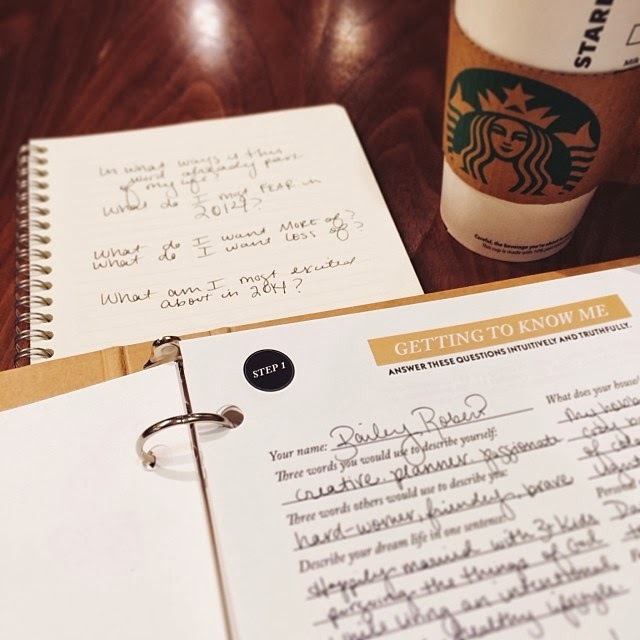 I am a journaling fiend, but sometimes I will have my "devotional time" and never touch the Bible. One verse here, one verse there has been the name of the game for too long and I want to remedy this. His Word is living, breathing, transforming! I read on Ann Voskamp's blog that they keep Bibles at the dinner table for meal times. Food for the soul. Even if my lunch break is my only chance in the day to dive in, I want to go deep. He can meet me in the break room, of this I am sure and expectant! 3. BE DILIGENT. Well that's broad isn't it? I am the queen of list making and planning, but the court jester when it comes to following through. This month I want to limit my to-do list to a handful of items with a clear purpose and definite end-date. Keeping it simple, sticking to task, and staying productive. 5. PURGE MY CLOSET. Actually, I don't have a closet. But I have 3 clothing racks that are full of clothes I do not wear and do not need. This may have been on my list from December, and I am actually going to do it this time. Some will go to a resale shop in town, others donated, and lastly I will not be buying any clothes in the month of January. Yikes! Talk about self-control. 5. FINISH GRAD SCHOOL APPLICATIONS. This is a no-brainer because alls applications are due at the end of January anyway. My plan is to have them complete within the next two weeks and on their merry way. 6. REVAMP MY ROOM. This, too, was on my list for December but it escaped me. I still need to unpack from traveling home for the holidays, and that purge will overflow into my trinkets and trunks. Simplifying means re-organizing, de-cluttering, and putting the final touches on the decor. I'll post pictures of the process and you'll get a glimpse into my little basement nook. How does that sound? Six goals, each with a game plan, should keep things simple. I want to keep my schedule open to say "Yes" to spontaneity and rest, to surrender my plans and ambitions to settle into my season, and to seek Him in the big decisions that are headed my way. Add in a little Shakespeare and a little sparkle, and I call that an exciting month. What are your goals this go-around? Any New Year's resolutions? I want to hear all about them!